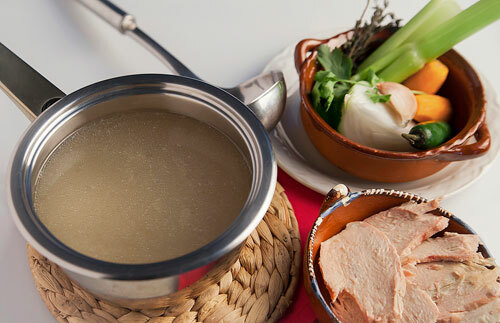 In the world of the broths there is the fish broth , the chicken broth and many more broths... but the pork stock almost nobody knows it, since it is used very little in the cuisine. But the fact that it is not used doesn’t mean that is bad, in fact it has a very interesting flavor. This stock is only used in soups that are prepared with pork and it serves to accentuate its flavor – like the pozole. *Remember that a stock is not a soup nor a cream. The broth can be seen as a flavored water or as a base ; used to prepare diverse dishes. Making the pork stock is the easiest thing to do, only the ingredients have to be cut and cooked and that’s it. To prepare the stock any piece of pork that you find can be used, even bones. We recommend using pork pieces with bone so the stock will have more flavor. The stock is prepared with pore so it has more flavor, if you don’t find it use 1/2 onion. The stock will be ready in 3 hours because it goes through a slow cooking process. Recipe for about 3 qts of stock. Cut into chunks the carrots that were peeled, 2.2 lbs of pork, 2 celery stalks and 1 ear of corn. Upon completion put them in a saucepan. Remove from the pork stock, with a kitchen spoon, the ingredients that were cooked. Strain over a food container the pork stock. When the pork stock cools is possible that a fat layer will accumulate, if this happens remove it. Tip: The vegetables and meat that were used to prepare the stock can be used to make other dishes . Suggestion: Prepare a very nutritious soup with this broth, some rice and minced chili. Variation: A similar stock the beef stock. Did you like the Pork Stock?